An innate ability to push beyond limitations and tap into our greatest human emotional and physical potential. Defense: Using its shell it has found a highly efficient way of self-defense allowing for survival and longevity. Slow: The path that leads towards fruitful self-actualization is slow – a marathon as opposed to a sprint. Wise: Around since the age of dinosaurs, survival, adaptation and peaceful existence embody the true essence of a mindful warrior. 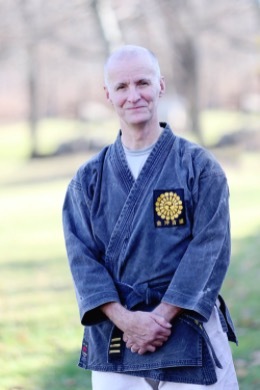 Sensei Terry began training Martial Arts over 30 years ago. He started out in Kyokushin Karate at the Saizen Dojo in Endicott NY. He trained Kyokushin karate briefly in New Paltz (where he must have trained with Shidoshi Sean when Shidoshi was only 14…. But he just can’t remember). 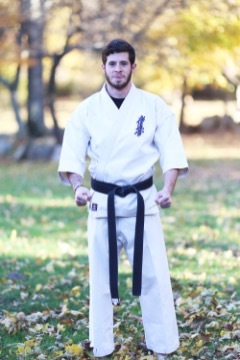 He switched to Tae Kwon Do after moving to Poughkeepsie NY. He has a 3rd degree Black Belt in Tae Kwon Do training under Kwang Jang Nim Robert Dvorkin. 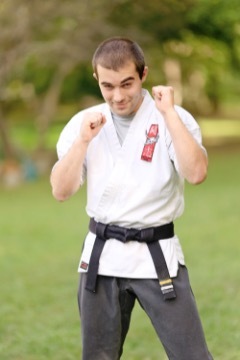 In addition he has trained Goju Ryu Karate, Pinjat Silat and has over 15 years of training in Matayoshi Kobudo (Traditional Okinawan Weapons). 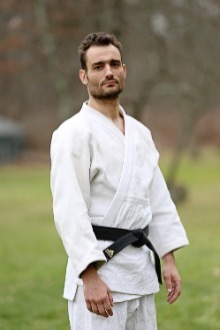 He joined Fighting Spirit Dojo when it opened in New Paltz and his three children are also students at the dojo. 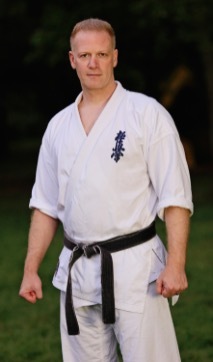 David has been teaching martial arts for over 20 years. His attention to detail and impressive depth of knowledge make him a highly regarded instructor. He has taught Karate World Champions as well as Professional MMA fighters. He was also a member of the 2012 WKC US National Karate Team. He considers himself a true student of the martial arts and is constantly seeking to improve his skills by attending classes and seminars taught by the world's best instructors. Charlie has been training in the martial arts since 4 years-old. He has been an instructor at FSK since its inception nearly 5 years ago. Charlie's original background was in Tae Kwon Do where he achieved his first degree black belt. He is an avid practitioner in the art of knife/gun disarmament and defense. Most recently, he has been exploring roots of Kyokushin Karate, one of the main "Stand-Up" styles taught and trained at the FSK dojo. He has competed in a number of Kyokushin/World Oyama knockdown, full-contact tournaments and has recently made Kyokushin Karate his main background, practice and focus. 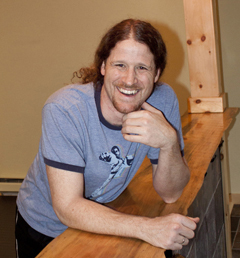 Charlie believes in strong inner spirit and commitment and he has a unique way of instructing: a firm belief that students learn best when watching an instructor, then applying and exploring their own physical motion/technique as opposed to talking about physical motion or technique. The learning is "in the doing" is Charlie's approach. 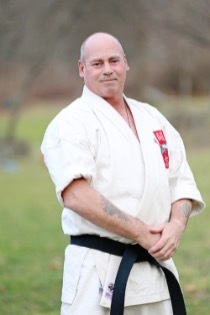 Sempai John Halstead, a long-time martial artist, has made FSK his home dojo for the past several years. He feels a dojo should be a place of mutual respect among teachers & students, one that lets an instructor continue to hone their skills, and most importantly, allows them an outlet to share the knowledge with many students. Sempai John enjoys the connection in sharing his martial arts knowledge, especially with the younger kids. Sempai John is known for his commanding loud voice and spirit which he uses to inspire the dojo with, daily. Finding ways to help students "find themselves" and their inner confidence is one of his main objectives. 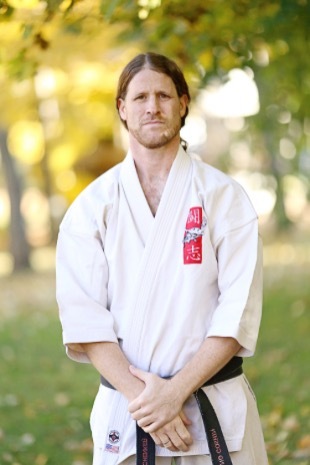 He currently trains Matayoshi Kobudo and Kyokushin Kata as his main sources of learning as a student of the dojo. 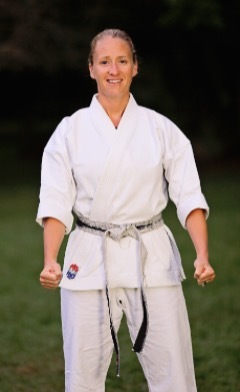 Katie began her training in USA Goju in 1991 studying under Kyoshi Thomas Maloney and Kyoshi Joseph Rinaldi. Over the past 15 years, Katie has expanded her martial arts journey, training in Goju-Ryu, Shotokan, Krav Maga, and now a little Kyokushin and Judo. Sensei Murphy trains and assists with classes regularly at Fighting Spirit Karate in New Paltz, NY under Shidoshi Sean Schenker and with Chris Dammann at Hudson Valley Krav Maga in Pawling, NY. Katie is a former competitor on the NASKA circuit and member of two US National Competition Teams where she represented the United States in World Games in Portugal, Spain, Canada, Austria, and Ireland earning Gold Medals in Traditional Bo Kata, Traditional Forms, and Creative Forms. Sensei Sergey's favorite martial art is judo. He has been practicing it for about 15 years, 10 of which have been as a black belt helping to teach students. He has solid competition experience and can help students to become strong competitive fighters. He also very much enjoys teaching newcomers to the art. His focus in teaching judo is to provide a solid knowledge base of the basics along with a competitive approach while also applying practical implementation of the art. Sensei Sergey says "I like the giving way and philosophy of judo and its principles of maximum efficiency and how they can be very useful in daily life." He starts his students providing them with a solid background of the "ukemi" (falling techniques). This is a very practical skill which can prevent injuries not only in the dojo but in day to day activities. Sensei Sergey is spirited with a strong conviction of purpose to his teaching, and always willing to share his knowledge. Joseph Liggera is a New York born and raised martial artist, and currently instructing at the Fighting Spirit Karate dojo. 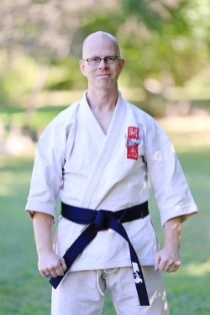 He earned his black belt under Hanshi Norman Tillory and Shihan Gloria Baker in the BSR Ken Zen Ichi Karate system in 2006, and his second degree in 2010. He spent five years training in Arana Brazilian Jiujitsu locally with NYMAG, before coming to FSK. 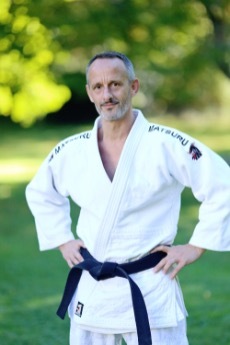 A firm believer in practical, intuitive mixing of martial arts, Sempai Liggera is happy and honored to be at a dojo that shares this belief, and cultivates an open, passionate community of like-minded martial artists, parents, and students. Ossu! After a long absence from martial arts, and a profound loss, Tom was lucky enough to return to training at Fighting Spirit Karate, near the dojo’s inception. A sense of wonderful purpose is a part of every session on the mat at FSK, whether as a student or as an assistant instructor. As Fighting Spirit Karate’s first internally promoted blackbelt, Tom appreciates the opportunity and responsibility he has to work with and help everyone else he can. He remains humbled and grateful for this honor, and for the investment of his amazing instructors and peers, most notably Shidoshi Sean Schenker who has opened the door to many amazing and gifted friends and teachers, including Virginio Minervini, Sensei David Kalish, Sensei Katie Murphy, Sensei Terry Quinn and other wonderful people. In the light of a desire to always be beginning again, Tom is grateful to have started training in Brazilian Jiu Jitsu under Virge Minervini, within the Equipe Jucao family and has been given his first ranking within that system. Fighting Spirit Karate is a warm and generous environment, where knowledge is shared freely and ego has little place. We learn and we pass it on!